The wind whistles through the metal rails flanking the boards. The waves wash the concrete structure and a queue weaves its way up the steps, spilling out onto the top board. Squealing youths launch themselves into the air, legs kicking as they approach the water, to land with a great splash. 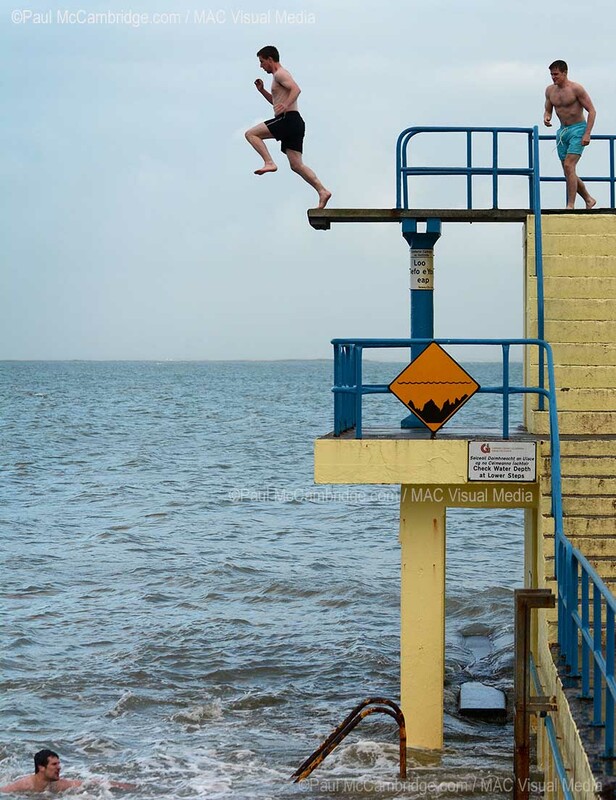 A rush of sea water and bubbles as they each claw their way up to the surface, gasp for breath against the cold and exhilaration, then, shaking the sea from their hair, race back to the steps and climb to the high board again. 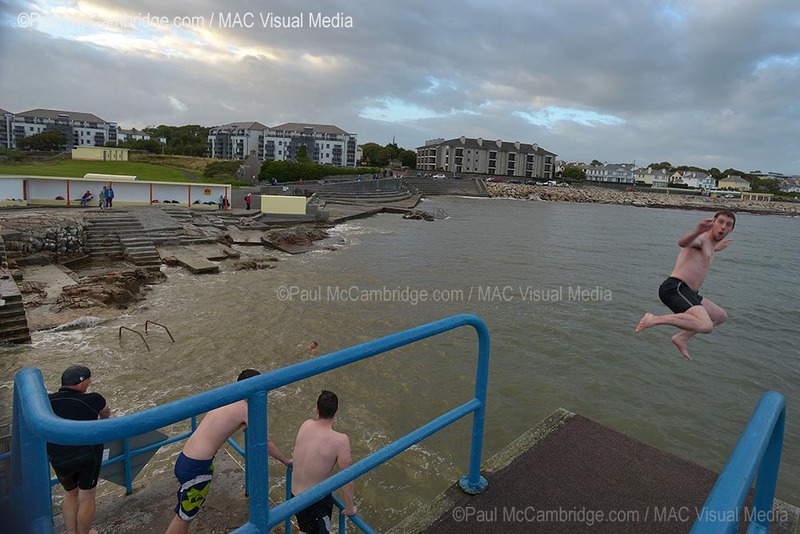 Mere minutes from Galway City along the Salthill promenade is where you will find these famous diving boards and this traditional sea bathing area. The yellow walls of Salthill, built at various angles to create shelter from the wind, invite one into the inner sanctum where white painted benches, strewn with towels and little mounds of clothing, run the length of each wall. 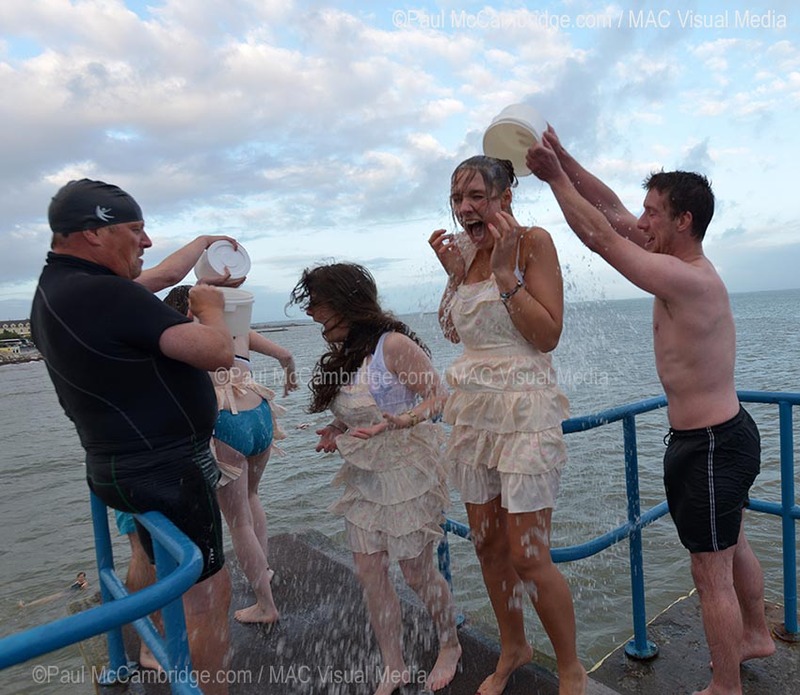 A community of sea-swimmers thrives here, coming from all walks of life. Early morning sees the business folk taking a dip before their commute. Mid-morning and the retirees club share swims, stories and cups of tea and after school and throughout the summer, the youths congregate. Following the traditions of past generations, the high boards have become a rite of passage. On the last day of school the leavers flock here in uniform to storm the sea, a release before exams begin. Encouraged and guided by the veteran divers, they progress from the lower and middle boards. Finally making their way up to the double-sided high platform. Egged on by each other and the older divers, they gain confidence, throwing themselves, twisting and somersaulting, towards the ocean. 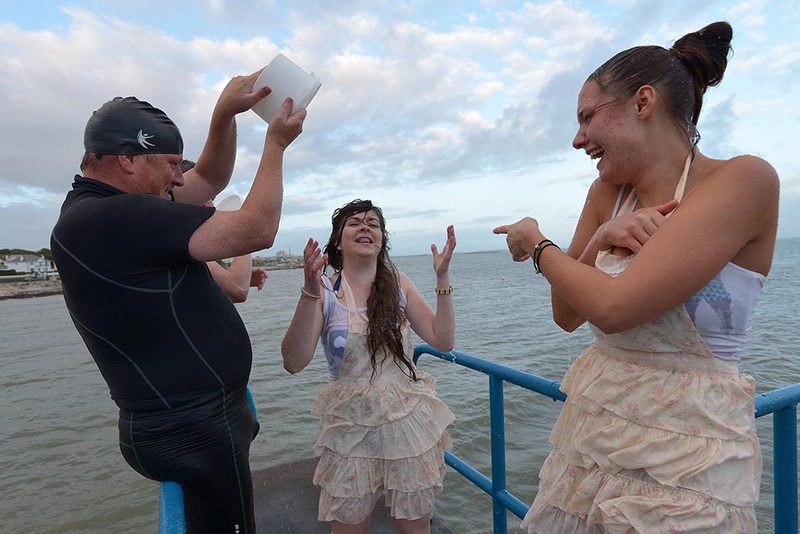 Now taking the ice-bucket challenge to new heights, a group of teenage girls arrived. Each clutched a small white bucket, pink fluted pinnies worn over their swimsuits. They giggled as they milled on the steps, each pushing another forward, none wanting to be the first, while the on-lookers smiled in amusement. They nervously followed the stream of boys up onto the high platform. The boys shouted as they leapt while the girls, one by one, edged to the front of the board, looking back for re-assurance, then, with courage plucked, a deep breath and a scream, stepped out. Squeals of delight as they re-surfaced, the girls joined the boys again in the race back to the top. Easy to find along the promenade and show-cased around the world in film, including Brendan Gleesons “The Guard”, the area is a hive of activity. Bicycle parking and toilets. Flanked by banks of steps, the near-side bathing area forms an amphitheatre above the sea stage, behind the double-ended boards soar up. Seamus Heaney wrote several poems in this area and along the promenade you can find quotations of his scribed on the sea wall. Here is the place to meet swimmers and find out about the local history, people will share with you the hidden beaches and will recommend the entertainment spots in the city.